This issue is all about ambiance—the environment or setting that’s part of the dining experience. When a new restaurant opens, it brings not only exciting dishes but also an energized atmosphere filled with the hopes and dreams of the owner and chef. Whether it’s the colorful interior of a restaurant known for inspired Mexican cuisine, a modern café that’s home to lip-smacking fried chicken, the cool lines and sophisticated martinis of a mall bistro, or a playful creperie serving a taste of Paris, there’s plenty to experience in the local up-and-coming food scene. What follows are four signature dishes offered by new eateries that launched or rebranded in 2018. Now’s the time to sink your teeth into these new beginnings. As Frida Bistro, this artsy eclectic eatery earned props for taking Mexican cuisine to a new level. Still owned by founder Jorge Fierro, the restaurant’s rebranding in May 2018 to Rico Cocina y Tequila Bar ushers in a more casual (and wallet-friendly) dining experience. Many of Frida’s favorites remain on the menu, but diners can now savor unique items such as pork-belly burritos and mole tamales along with a wide selection of tequilas and other spirits. 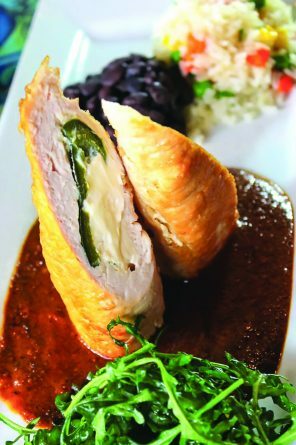 One signature dish sure to please is the pollo rebosado en salsa de cacahuate—a lightly breaded chicken breast stuffed with cream cheese and a poblano pepper. The chicken is pan fried, sliced in half to expose the stuffing and beautifully plated over a bold and spicy peanut-and-guajillo pepper sauce. Rice, black beans and an arugula salad provide the final touches. 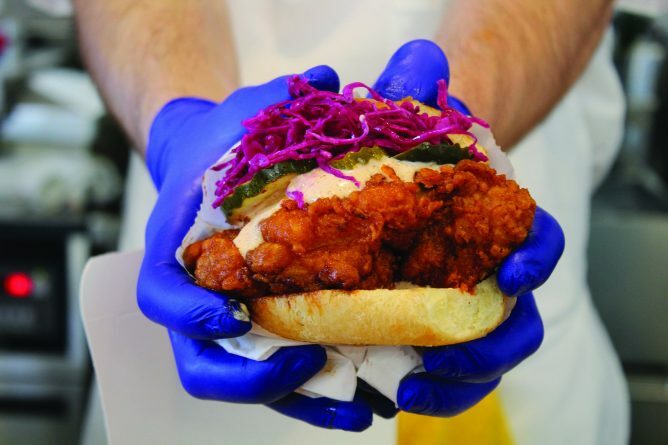 Stroll down Regent Street around 11 a.m. or 5 p.m., and you’ll see hungry hordes lining up at Pretty Bird, a Nashville-style hot chicken eatery opened in February by Utah’s very own Iron Chef, Viet Pham. 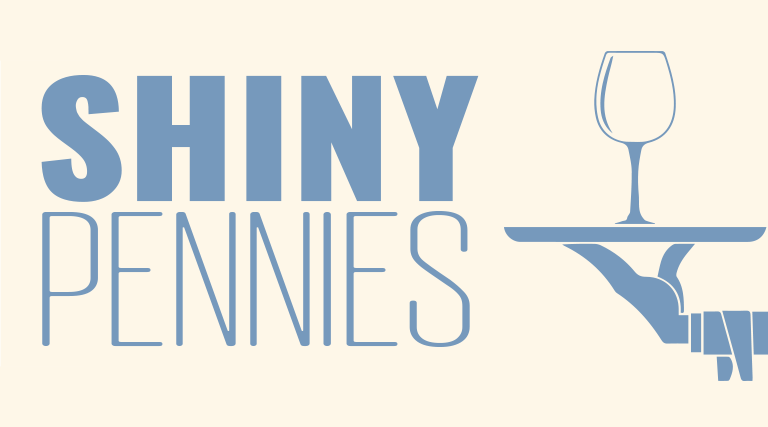 With limited seating, it’s more of a take-out place, but patrons don’t care! They can hardly wait for the crunch as they chomp down on a deep-fried boneless chicken thigh served at spice levels ranging from mild to the daring “hot behind.” After you’ve placed your order and sealed your spicy fate, your jumbo-sized chicken quickly arrives on a buttered bun topped with slaw, pickles and a creamy Pretty Bird sauce. Ordering a combo ($15) gives you a side (crinkle-cut fries, for the win) and a soda. Twigs Bistro & Martini Bar opened in June at the south entrance of Fashion Place Mall, providing the liquid courage or comfort food needed for an arduous day of mall shopping. This Spokane-based bistro offers a wide range of American bites—from roasted Brussels sprouts and flatbreads to pork osso bucco and salted caramel cheesecake. 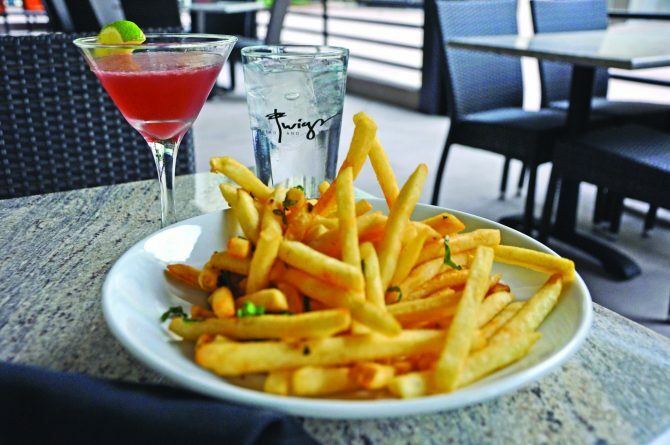 To fuel your shopping excursion, find a comfy chair on the patio and order their signature Razitini—made with Tito’s Handmade Vodka and Bols black raspberry liqueur—and pair it with a pound of Twigs’ zesty fries seasoned with cayenne, rice vinegar and basil. Walk it off in the mall! Bravo pour les crêpes! As of March 2018, food-truck operators Maxime Ambeza and Raysha Carrasco found a crêperie to call home, a charming and colorful restaurant in Sugar House filled with artistic touches of Paris. Even the menu is playful, featuring savory crêpes (made with Maxime’s grandmother’s recipe) such as L’Arc de Triomphe (chicken, mozzarella, guacamole, peppers, tomato and basil) and sweet treats such as the Monsieur (Brie, apricot confiture, powdered sugar and whipped cream). 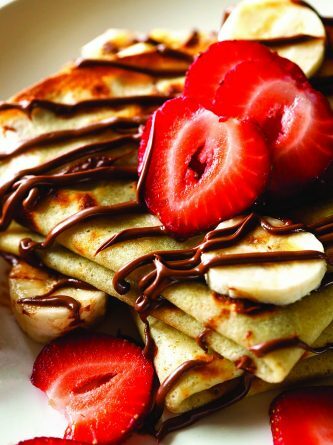 For a sweeter crêpe, try the Champs-Élysées, stuffed with fresh strawberries and bananas, drizzled with Nutella and nested next to a dollop of French-style whipped cream.